Mommy’s Best Games delivers yet another oddity in the form of Pig Eat Ball. This game features a young pig princess named Bow living on a space station filled with clam people. Her father, King Cake, has decided to host a competition to win his daughter’s hand in marriage. But Bow has a different idea… she dons a disguise and enters the contest herself. 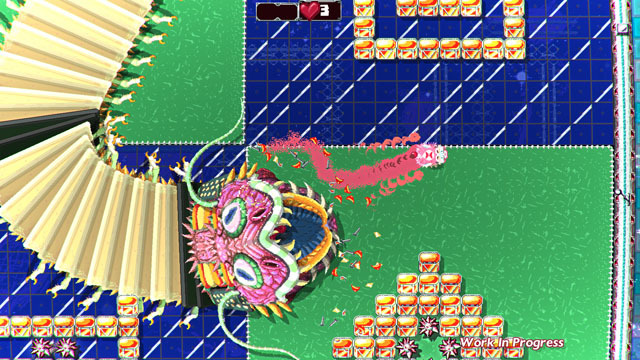 The game features a number of different level types, most of which center around eating tennis balls. However, if you eat too many tennis balls, you get too fat to fit through narrow corridors, so you have to barf them up, slip through, and then re-eat the barfed up balls… called “barfies” for short. The game also features a number of competitive multiplayer modes for up to four players where players race each other, fight over tennis balls, and even build sandwiches. The game also includes a level editor. The game is now available for PC, Mac, and Linux via Steam, Humble Store, and Itch.io, and has a playable demo here. The game is also coming to PS4 and Xbox One. Check our coverage here.